When building a campaign in Outbound Automation, you are limited to the lists and creative elements that are already built into your system. So before we start, take a look at the checklist below. Have you created the list you plan to use? Have you built ALL email creatives you plan to use in this campaign? Do you have all ESPs you plan on sending with integrated into your account? If each of these steps are complete, you are ready to build a campaign. Go to Campaigns, click the Add New Campaign button then click Build Campaign. 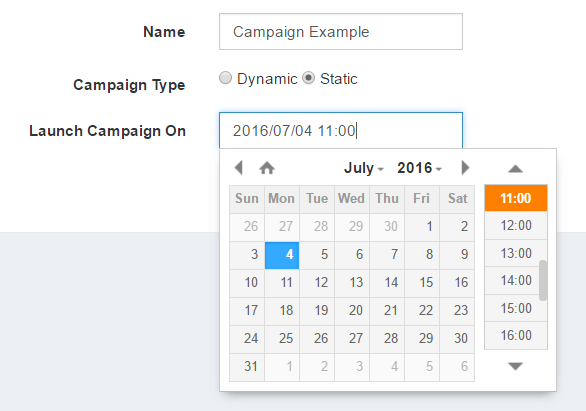 Name your campaign and select the Static campaign type. Next, specify your date and time to launch your campaign. You can change this launch time at any time before activating your campaign. If you activate your campaign before its launch time, the campaign will not launch until reaching its launch time. If you activate your campaign after its launch time, the campaign will send as soon as it is activated. Next, select each of the lists you’d like to use for your campaign. You can only use static lists for static campaigns. Once your list(s) have been selected, click next step. Next, you must select the metrics you would like to track. We highly recommend tracking Email Opens and Email Clicks for every campaign. If you do not, your reports as well as your end goal tracking may not record correctly. Your third option is to generate a tracking pixel. If your end goal is Page View or Pixel Fire, you must select Yes for this option. Once you do, you will have the option to track revenue for the pixel. Click Yes to track revenue and associate a hardcoded revenue value for the pixel fire. Note: Tracking revenue is only available for the Sale Conversion Pixel (Pixel Fire). Finally, select your Action Upon End Goal. This action will take place once the lead completes the end goal, which will also shut off all subsequent events in the campaign for the converted contact. To do nothing and simply end the campaign for the contact, choose End Campaign. To move the contact to a new list (where they could potentially be added to a new campaign), select one of your pre-created lists from the table. Click Save Campaign Outcomes and Continue. Next, you will add each event and the rules associated with each to your campaign. Name your event (used for internal use only) and select the Email event. Next, select the Email you would like to use from your creative library. The event trigger allows you to decide when this event will send. For your first event, your only options are to send immediately (as soon as the campaign is activated) or delay the number minutes, hours or days of your choosing. For each subsequent event, you will have additional event trigger options including page view, pixel fire, link click and email open. For email events: select each ESP you would like to use to send this event and click next step. We highly recommend choosing at least two ESPs for each event. For email events: use the table to specify your sending percentages through each ESP and to each ISP. Read our best practices for utilizing multiple ESPs. Next, you have the option of setting hours to send and days to send restrictions. If these tools are switched off, your event is eligible to send at any time. Click Next Step. If you would like to modify your hours to send within this timeframe or select specific days to send, you can set that here. Finally, you will be taken to an event summary page. To add an additional event to your drip, click Add New Event and repeat. Once your drip campaign is built to your specifications, click Finish. This page is a recap of the entire campaign you have just constructed. If you are satisfied with your campaign click Save and Pause. 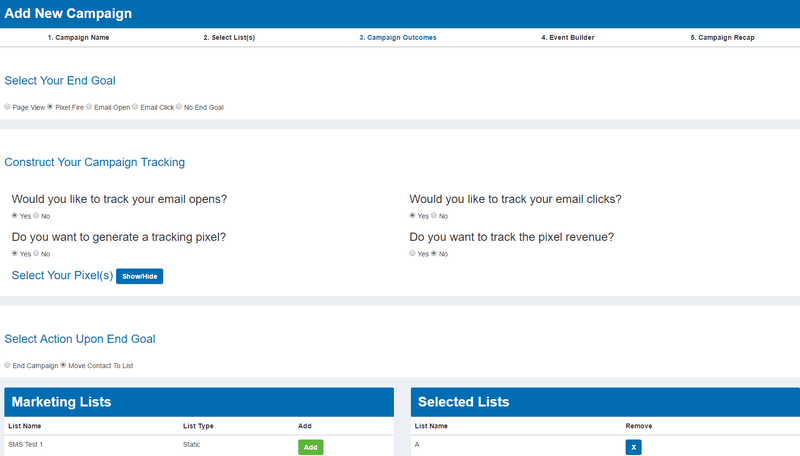 From here, you will see your campaign in your campaigns dashboard in a paused status. Click the paused button to activate your campaign.